If you are visiting Belitung Island, you should head to Tanjung Pandan. It is the home of a fabulous Blue Kaolin Lake. The lake is located in Air Raya Village. In terms of beauty, it is similar to Kawah Putih Lake in Ciwidey. Though, it emits different charm. The lake was formed due to a mining activity. Kaolin mining was abandoned. Today, it becomes one of the greatest attractions in Belitung. The lake is located in the roadside, so everyone can reach it without hassles. The size is massive. Blue Kaolin Lake water has the color of blue Tosca. The water is clear and the lakeside is pure white. Due to its size, it is a little bit troublesome to find the right spots for sightseeing. Apart from the main lake, there are some small ponds. All of them share the same beauty. The clear sky reflects on the water surface. It is quite mesmerizing. Actually, you can also enjoy its beauty from the road. Thanks to the strategic location! Once you arrive at the lake, you may find clear water and clean land. As the name implies, the lake radiates blue color. It was formed due to the mining activity in the past. Kaolin is a type of mineral. It’s used to produce paper, cosmetic, foods, etc. The most common activity is sightseeing. Tourists can get around the lake easily and enjoy the scenery. There are piles of sand. They create numerous small hills around the lake. In the midst of it, you can find a land. The best time to come is when the water recedes. Unlike a crater lake, Blue Kaolin doesn’t produce an unpleasant odor. Thus, visitors can spend much time here. Not to mention the water is safe. It isn’t hot. You may expect some kids and adults bathing in it. Due to this reason, swimming becomes a fun activity. The rumor has it. The water can improve your skin’s quality. That explains why many visitors every day. If you come to this lake, make sure you don’t miss that opportunity. Don’t forget to carry some clothes, though. Another thing to do in Blue Kaolin Lake is photography. You can find many interesting objects nearby. For instance, there are sand dunes. The combination of blue and white is indeed splendid. The lake has become a worthy background for photography. Sometimes, people also take advantage of the lake for pre-wedding photo session. The best time to visit is either in the morning or afternoon. Since there are no shady trees, the temperature can be quite unpleasant at noon! 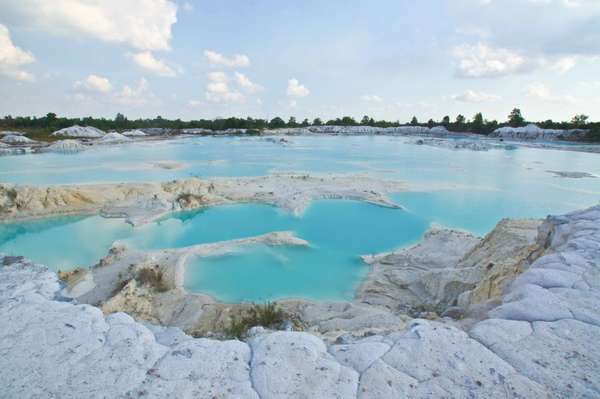 Blue Kaolin Lake is quite reachable, especially from Tanjung Pandan City. It takes about 10-15 minutes. Since there are not many public transportation options, it is better to rent a car. When it comes to facilities, you can’t find anything. Though, there are several hotels in Tanjung Pandan. Make sure you have prepared some money and information.